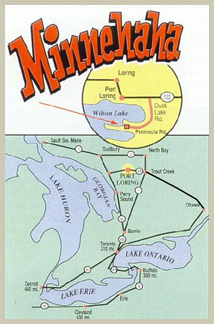 40 Miles to Fish and Explore on the Pickerel River System. From Highway #69 head East on Highway #522 for 60km to Port Loring. Turn right on Duck Lake Road for about 2km. Turn right on Penninsula Road follow for 1/2km. Turn right at Minnehaha Camp Resort Sign. Turn left at Duck Lake Road for 2km. Turn right on Penninsula Road for 1/2km. Follow Highway #69 or Highway #11 to Highway #522 to Port Loring.